We can expect a 2014-like unprecedented voter swing in Uttar Pradesh. The oft-repeated cliché in political circles that ‘the road to Delhi passes through Lucknow’ has been proved right more than once. Uttar Pradesh (UP) was singularly responsible for the Bharatiya Janata Party’s (BJP’s) glory in 2014—it got the party two-thirds majority in the Lok Sabha. Little wonder then that every party that wants to defeat the BJP in 2019 is busy forging alliances in UP. 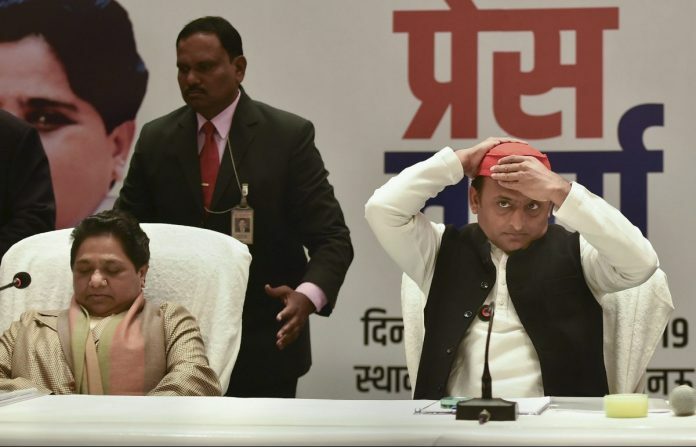 Amid great fanfare, two political arch-rivals—the Samajwadi Party (SP) and the Bahujan Samaj Party (BSP)—announced their pre-poll alliance for the 2019 Lok Sabha elections, deciding to contest 38 seats each out of 80 seats, leaving only two for the Congress. This rejection of the Congress, led by president Rahul Gandhi who represents Amethi, is seen as a big blow to the anti-Modi alliance that the grand old party is trying to forge across India. In a scathing attack on the Congress, BSP supremo Mayawati qualified her rejection, saying that the Congress coming to power is equivalent to the BJP coming back to power. The statement assumes significance as the BSP will target farmers and the traditional backward classes while the SP will stick to its own voter base. With these two vote banks lost, the Congress is not left with much option. The charges of graft will not backfire on the BSP supremo—unlike they would for the Congress—as her voter base will not question the involvement of the ‘Dalit ki beti’ in corruption. As far as the SP is concerned, its alliance with the Congress in the 2017 assembly polls resulted in a washout. Compared to the 2012 results, where the SP had 224 seats and the BSP 80, their total tally (324) shifted to the BJP in 2017—with the party getting 325 seats. The Congress’s tally has been consistently falling since elections before 2012. Therefore, it is not surprising that both SP and BSP have very strong reasons to dump the Congress. In the 2018 assembly polls, the Congress fought against the BJP and posted an impressive victory in Chhattisgarh. It registered a not-so-satisfactory triumph in Madhya Pradesh and Rajasthan where it had expected a greater number of seats. Given its performance, the Congress has reason to believe it can stage a comeback. Rahul Gandhi tried his best to conceal the affront of being treated like an ‘untouchable’ in coalition politics and maintained that he has ‘tremendous respect for Mayawatiji, for Mulayam Singh Yadavji and Akhileshji, and they are open to do what they choose’. With ‘gathbandhan’ politics picking up steam in UP, it could be advantage BJP. Both the Congress and the BJP have benefitted electorally in a straight contest. With SP-BSP combine forming a strong alliance, the BJP is faced with but ‘one party’ and can thus avoid a multi-cornered fight in all the 80 seats. The BJP got all 19 seats in UP’s Bundelkhand, and 66 out of 76 seats in western UP in 2017. Going by the last Assembly elections, it will be easy for the BJP to fight the SP-BSP combine even as the Congress will eat into their vote bank in central and eastern UP. Besides, it is doubtful if the socially conscious caste-based voters of these two parties would accept local level leaders and candidates of their rivals even as their state-level leadership publicly exhibits camaraderie. The Constitutional Amendment reserving 10 percent quota for the economically backward upper castes has sent out a strong message to the non-SC-ST vote bank that the Modi government cares for the poor among other sections of the society (read Brahmins and other forward castes) while the Bill is being touted as a masterstroke—a shift from caste reservation to class reservation. Although the Congress supported the Bill, it will find it difficult to gain the support of this vote bank—which has shifted to the BJP in the last two decades. Under pressure from the Rashtriya Swayamsevak Sangh, the Vishva Hindu Parishad and other pro-mandir groups, and with the Supreme Court’s repeated postponements and indecisiveness on the issue, Modi could attempt to bring a Bill for the construction of the Ram Temple at Ayodhya in the last parliamentary session before the 2019 elections. A strong pro-development pitch, 10 per cent quota and the assurance of the temple can cause an unprecedented voter swing—taking the BJP’s tally beyond the 2014 mark and making the jingle ‘Ab ki baar, teen sau paar (this time 300 plus)’ come true. BJP is likely to be doomed in the 19 LS elections from U. P. if BSP-SP combine does not repeat its suicidal mistake of fielding a large number of Muslim candidates, leading to communal polarisation. In 14 BSP and SP fielded 20 & 12 Muslim candidates respectively and all lost. But the BJP seems to be blissfully ignorant of it. That is why smug optimism of the BJP is there.